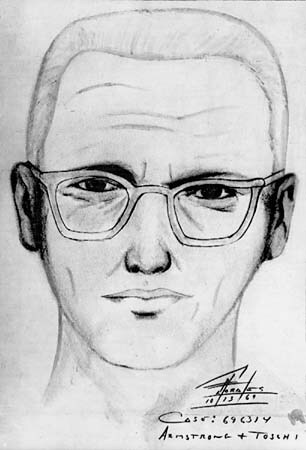 The TV channel HISTORY is launching a series about the Zodiac Killer. 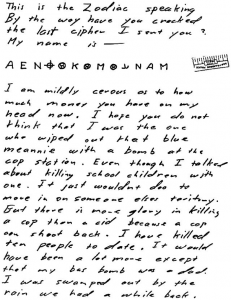 Allegedly, a solution to one of the famous cryptograms created by this serial killer will be presented. 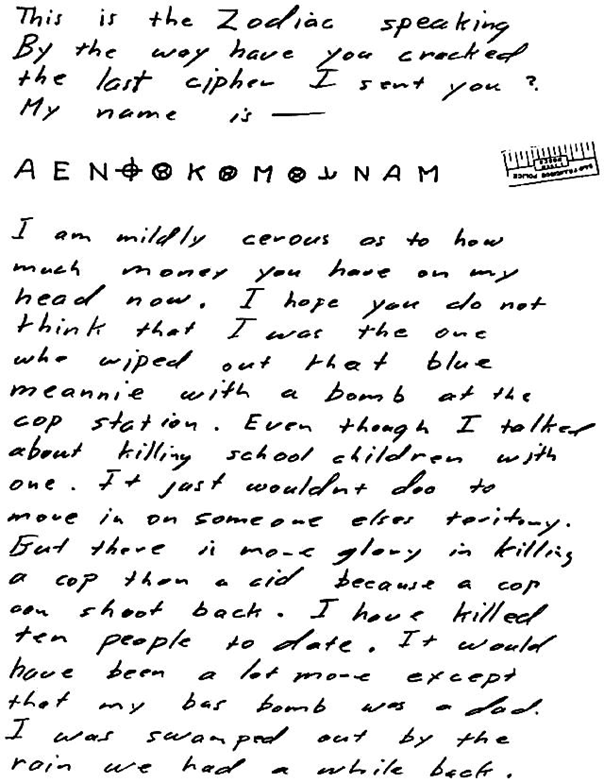 Throughout the late 1960s, the Zodiac Killer, one of history’s most famous unidentified serial murderers, terrorized America in a spree of heinous attacks, sending taunting letters to the public. As #3 and #4 are too short for an unambiguous solution, codebreakers usually focus on message #2. Is has never been solved. 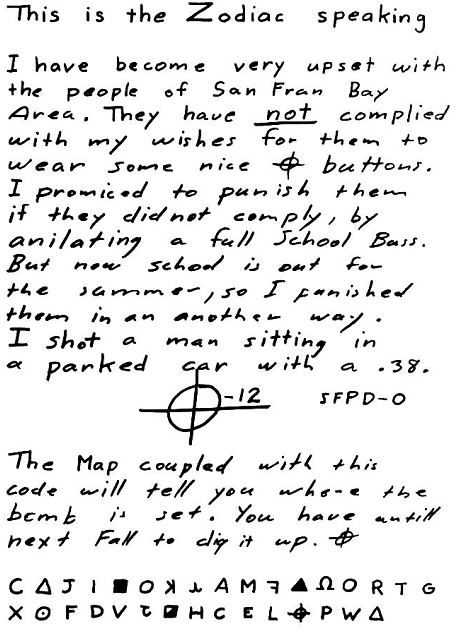 Has the second Zodiac Killer message been solved? Now, a new TV series, The Hunt For The Zodiac Killer by HISTORY (formerly known as The History Channel), opens up a new investigation into the mystery of this serial assassin. This five-part limited series will premier tomorrow, Tuesday, November 14 at 2200 ET/PT. It will launch on HISTORY UK on Wednesday 22 November, 9:00PM GMT. Allegedly, The Hunt For The Zodiac Killer will present new evidence, new witnesses, new clues, and new information from representatives of the CIA and FBI. A super-computer named CARMEL (“the first of its kind programmed to think like a killer”) will play a major role. 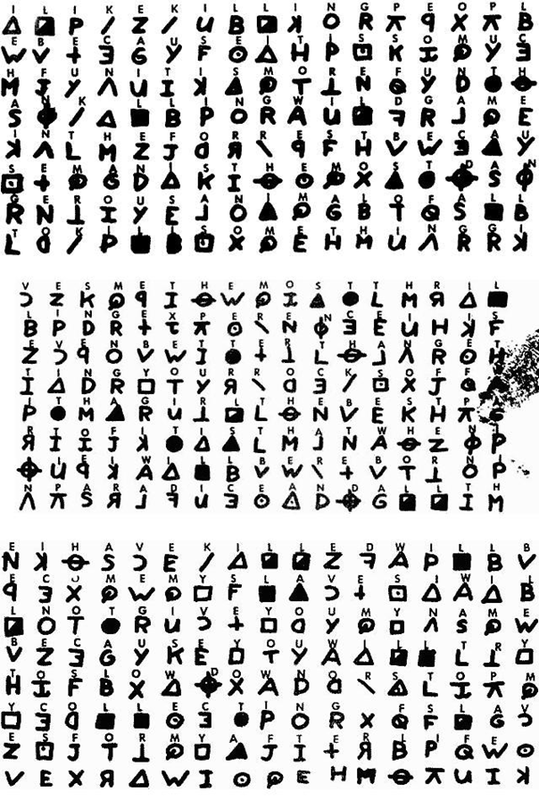 According to a press release, a team of codebreaking experts hired by the producers of the series believe that they have broken a significant portion of the second Zodiac Killer cryptogram (sometimes called Z340). If this announcement proves correct, we will soon see one of the greatest codebreaking successes of this century! Usually I doubt claims like these. 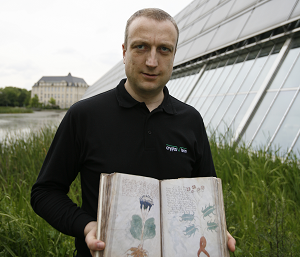 The Voynich Manuscript has been “solved” at least 50 times without a “solution” ever beeing accepted by the experts. Other famous crypto mysteries have been “solved”, as well. This is also the case for the second Zodiac cryptogram. For instance, here’s a video about a “solution” and here’s an article about another one. … mathematics professor, editor in chief of the scientific magazine Cryptologia, and author of the great book Unsolved. At the NSA Symposium on Cryptologic History I talked to another experienced codebreaking expert (he didn’t want me to mention his name), who was involved in this TV production. He confirmed that the solution found by his colleagues was correct. So, chances are good that we will soon witness a sensation. How to watch this series? It goes without saying that I am looking forward to watching this series. However, I don’t know how this works best from Germany. Here’s a website with a HISTORY livestream. Does a reader know a better one? 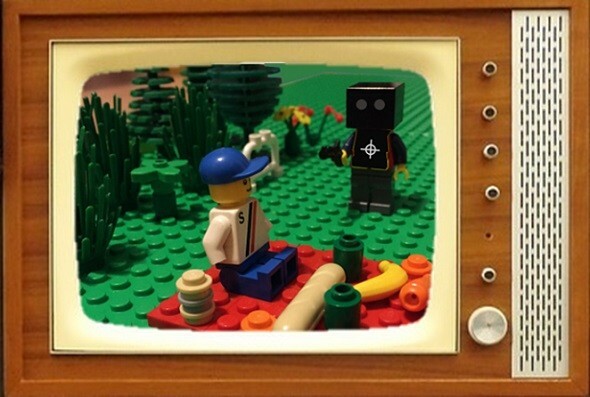 Will the episodes be available online after they have been broadcast? Any hint is welcome. @David Oranchak: Thanks for the hint. As you can be seen in the preview, you’re apparently a member of the codebreaking team, too. For those who don’t know David, here’s an interview I made with him. That cipher has so many rarely used characters that if you accept “partial solutions” as something useful you can make it say literally anything you want. I could make it say Klaus is the Zodiac. How do you program a computer to think like a killer? There are many ways that killers think, I just can’t see how? And the “experienced codebreaking expert,” who didn’t want his name mentioned on this blog, is a cryptographer, not a cryptanalyst. I know, because that anonymous source has corrected me on that point before. I, too, heard him endorse the Z-340 “solution,” but I was not at all convinced. 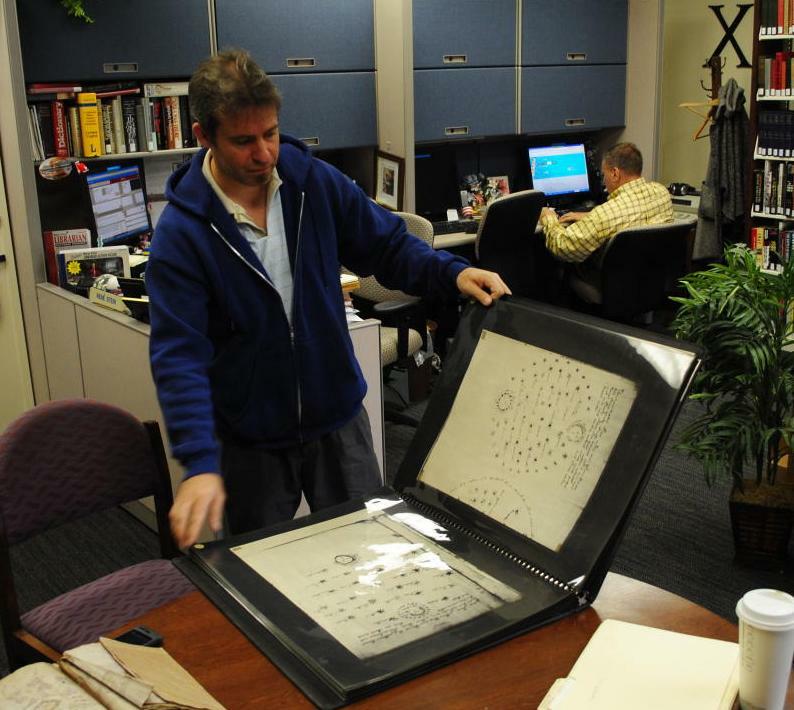 So Craig Bauer cracked the Zodiac cipher between the printing of his new book ‘Unsolved’ (Zodiac cipher still unsolved, probably summer 2017) and the making of the HISTORY series? The highly respected expert (the one who’s a cryptographer, not a cryptanalyst) was apparently shown something to get him to endorse their proposed Z–340 solution. History likely showed him whatever was needed to dazzle him, and withheld whatever context or content would have persuaded him otherwise. History’s own press release about “The Hunt for the Zodiac Killer” provides this revealing statement: “This team *believes* they *may* have broken a significant *portion* of the diabolically complicated code.” [Emphasis is mine.] Serious code breakers don’t talk that way. Either they broke it, or they didn’t. We’ll see today how this all plays out. To the uninformed, History will likely make its case. If they say Sasquatch is the Zodiac killer, then they’ll prove it to the satisfaction of the masses. But no matter how their confetti-edited sound bites and convincing reconstructions make you feel, ask yourself this question at the end of the day: Did Craig (or the team or whoever) decrypt Z–340 in an independently repeatable way that recovered an intelligible message? In other words, could the rest of us, given a different message that had been encrypted with that same system and keys, recover unambiguous plaintext? Has anyone watched the first episode. Any crypto related stuff? With Episode 1, History has lived up to its reputation of manipulating its contributors and its audience. And there was nothing crypto-related worth mentioning. As expected, I couldn’t identify a single piece of new evidence in the episode — cryptologic or otherwise. Everything brought up as new discoveries, including from supercomputer Carmel’s alleged output, was stuff we already knew. The cryptanalytical stuff was mostly taken from the presentation material that Dave himself has shown us as examples of the many interesting patterns that can be found in Z-340. The stuff that History wants you to believe was spit out by their Think-Like-a-Killer machine has actually been pointed out by Dave before (at least back to 2015, maybe earlier). The case that History is building up around Ross Sullivan (using evidence that we already knew about) is the same case that could be made for any of the other top ten or so suspects. They just picked one and ran with it. He HAS to be the one, because the odds of these pieces of evidence being coincidence are 1 in whatever. Of course, the same thing can be said of many other suspects. This show is purely entertainment, at least for those who don’t care that it’s complete garbage. Wow, cool when the Mission Control Center’s supercomputer revealed two trigram repititions. Ready for liftoff! @Thomas, I think you’re referring to Dave Oranchak’s “pivots” — the two L-shaped features that the show’s producers expect people to believe were found by Carmel. In fact, the computer had nothing to do with it. Dave has been talking about those “pivots” for at least a couple years. History doesn’t make real documentaries (anymore). There’s nothing there for the serious researcher, scientist, or historian. At best, it’s entertainment. The way they edit and package stories is extremely (and intentionally) misleading. I’m not a fan. As an occasional reader of zodiackillerciphers.com I know this isn’t anything new. Just was stunned watching four cryptanalysts in front of a wall screen, reminded me of a movie scene in a NASA Ground Control Center. Moreover, I was surprised that Californian IT experts have supercomputers that are capable to perform difficult tasks such as finding trigram patterns in a 340 character text. 😉 The redundancy of such documentaries is unrivaled, hope this isn’t going to be cryptological eyewash. History documentaries in general have evolved into a horribly stylized format, to the point that if you – gasp – happen to actually know anything about the subject being covered, they are painfully close to unwatchable: and there’s no reason yet to think that this series will buck that televisual macro-trend in any great way. Yep, it’s all hype and theatre and deception. On the investigative side of things, having selected which suspect to build the show around, they’re simply retracing the steps of others and acting as if they’ve made the discoveries themselves. On the cryptanalytical side of things, they’re doing the same thing, simply pointing out things we already know and acting as if their “supercomputer” made the discoveries itself. Don’t be surprised if they play up Carmel’s dark, artificial-intelligence capabilities in the coming episodes (because she thinks like a killer). And poor Craig: one of the teasers has him saying that he broke Z-340. That sets a pretty high bar for expectations. Anything short of a legitimate, full solution by the fifth episode is going to be met with a bunch of us asking “Why did you say that, if it wasn’t true?” My guess is that he teased out a few bits of “plaintext,” maybe something we’ve already seen, or maybe even the name of Ross Sullivan, and probably without the help of Carmel. It’ll be added to the pile of other nonsolutions we’ve seen. 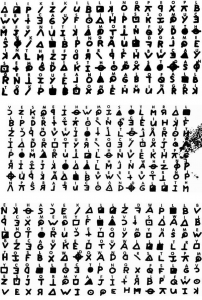 One can find just about any name or phrase ones wants to find in the cryptogram (à la Ted Cruz), but a professionally accepted full solution is a completely different story. I’m standing by with a copy of Z-340, ready to apply whatever Craig’s methods and keys are. What are the odds that we’ll be able to duplicate his 340-character solution? With so many variables at play, I doubt if the Z340 has been solved. It will have to be a completely watertight solution. If it is vague in any way or requires a long-winded explanation, we can only expect it is probably not a viable solution. I have an undergraduate degree in German, the professor called this channel “the Hitler Channel” for obvious reasons, 15 years ago, I believe 90% of programming was inflammatory anti German material of questionable translation and accuracy, now it’s all Ancient Aliens, and the info on that I do know for fact they discuss is far from the truth so I don’t watch it, but have accidentally been exposed (such as the “alien” Allister Crowley invoked, I won’t discuss what that was, but it can be researched and is a creation of sexual, male ritual) Regardless, this Zodiac show…I am watching this critically, a lot of the “new” info such as killing on moon dali days has been known from the beginnings, and I’m not sure that all events did correspond to those days. As for the Carmel computer, I’m sceptical, they said the computer spontaneously began to write poetry as if it were the killer as proof it is thinking like the killer, yet this “poetry” was simply an arrangement of factual inputs of known facts regarding the zodiac events. It struck me that anything they get from this computer will not be it thinking like the killer but rather it regurgitating the opinions of its programmers. There are many opinions in this issue. What if it were multiple killers, as it is widely believed with the son of sam killer now? We just don’t know, and I feel like too often the justice system in general tries to “solve” cases and maybe point fingers at the wrong individuals for a tidy solution to pacify the masses, giving the illusion with technology being infallible. I would love to see the zodiac mystery solved, I have read several books that all present air tight proof, all implicating different individuals. Anyone of them would have convinced a jury. This show will be no different. My big fear here is the magician act, the stage show of using technology to divert us and convince us from using our reasoning capacities and believing it because a computer is somehow greater than man, when really it is man that builds, programs, and decides which information to feed to (and what to omit from) this computer. This man Ross Sullivan they keep implicating died in the 1970s, but what we tend to forget is that both the victims and the men they are naming as suspects have living friends and relatives. I hope they are not causing pain or shame to real people in the name of sensationalization. It would be more ethical to try and solve this case quietly for the families and perhaps do a tasteful documentary if they really feel the need…just the whole presentation of this makes me think it’s a charade. With the time I’m saving all of you, please go back and re-read the comment from Bethany, above. I have followed the Zodiac case about as carefully as an amateur can and have read widely on the subject. I agree that much of the “discoveries” made by the program are not new. That said, their choice of their two top suspects (Sullivan & Kane) is interesting. The circumstantial evidence is also interesting, though again, is obviously just circumstantial. I also concede that the program has been presented in a way to overly excite and dramatize but also to stretch it out. This could have easily been a single episode documentary or even two but clearly they have for commercial reasons stretched it out in an old fashioned serial movie way. They have to make back the money that clearly went into the production, so I consider that a fair trade-off. The most important point though is, while you should not let the entertainment element gloss “wow you” into agreement with their conclusions (whatever they wind up being) at the same time you should not allow your prejudices against “vulgar media” (I mean that description literally rather than as an insult) blind you to a valid argument. I find it amazing that posters here can off hand dismiss the show’s shallowness yet just as quickly and without any hint of irony then pronounce a z340 cipher “solution” completely wrong without actually have heard what the solution is. The individuals they have hired are not a bunch of crime nerds sitting around a basement table geeking out over the minutiae of the Zodiac case: they deserve a significant level of respect in that each of them have solid credentials in their respective fields. If Zodiac had actually been cracked, this would already have been a press release in cryptographic journals and even possibly popular web pages. Go back to sleep, everyone. Nothing to see here. Has the second half of the cipher been flipped to see if it may potentially have the code upside down? To the doubters here – I guess you have to eat some crow as we say in the colonies. They do appear to have cracked it, and not only did the experts on the show back that up, but they got a couple of outside experts of significant repute to validate the proposed solution to 2/3s of the cipher. Whether the middle third (and remember the Zodiac broke up one series of ciphers into three parts) actually contains something remains to be seen but cracking the other 2/3s is a remarkable achievement. @Reggie, I’m not sure if your comment was meant as satire. If you’re a cryptanalyst, then it was, of course. I apologize, in advance, if I’m incorrectly assuming that you were serious. Nope, no crow on my plate tonight, but Jew-Lee’s barbecue yardbird was awesome. Craig’s “remarkable achievement” is no better than any of the other garbage Z-340 decryptions that others have floated over the years. The “outside experts of significant repute” did not survive this series with their reputations intact. I’ll weakly defend them by considering that it’s likely that they were taken advantage of even more than they thought they would be. They should all have known better and not allowed themselves to be used in this way. It’s too late now for them to make excuses about not knowing how the History channel operates. It was extremely sad to see this done to Ed Scheidt, former head of the CIA’s cryptographic section. Ed spent about 5 hours chatting with the Karga Seven clowns (according to a mutual friend), did no analysis of the cipher on his own that I’m aware of (none was shown or mentioned, and that’s not something he would be qualified to do, anyway), and then ended up with a brief and humiliating cameo. He was used. He was abused. This was a total nonsolution. No legitimate code breaker would say otherwise. I challenge Craig and Dave to come on this forum, right now, and defend the solution. No one will edit their remarks; no one will twist their words; no money will change hands. Craig and Dave, tell us: Do you really think this is a legitimate solution? Could the rest of us, openly sharing the system and key that Craig discovered, write a message that either of you could solve? I am fairly certain that neither of them will defend this solution here in this forum. What an absolutely awful, awful show. All of their “discoveries” are in fact old facts. They act as if they are rediscovering them in real time, but it is clear their discoveries are scripted. They make massive jumps in logic, or no logic at all, force facts to fit the narrative, and operate on some of the flimsiest suppositions. I was especially annoyed when they went into the woods to look for a body when it was clear that the “solution” to the Tahoe cipher was a fraud. Whoever wrote it clearly looked at a map and created a solution from there. Or when they found larvae and claimed that it could belong to a fifty year old body. Ha! Or when they dug up arbitrary places on Mt Diablo near gravel even though the Zodiac claimed he would use “bags of gravel”. Or when the one guy dug a hole, found nothing, and then claimed that the hole once contained “something”. Yes it did. It contained dirt, which you removed. Or how they traveled to New York to go in search of Zodiac based on a letter that looked absolutely nothing like any of the other letters. How much did they pay that handwriting expert to lie? Or the garbage “supercomputer” that spits out whatever nonsense they feed into it? What’s even worse is that the supercomputer is working on programs that are woefully inept to do more than basic codebreaking. A computer that thinks like the killer? It doesn’t think at all, and even if it did, how could it think like a dead man just from a handful of data? What a bunch of crap. I also like the shots of the motel rooms where for some reason the “investigators” have image of the Zodiac material papering the wall. They move into a motel/hotel room and start hanging up crap? I could go on and and on and on about this terrible, terrible show, but suffice it say it is a fraud, and The History Channel should be brought up on charges of fraud and the people involved, especially Oranchuk, should be deeply, deeply ashamed for participating in this blatant garbage. And yes, the cipher solution is pure bunk. I’m not a cryptographer, but even I can see that Craig just chose an arbitrary interpretation of the symbols, based on the idea that some would represent themselves (a very OLD idea) and then stopped when his interpretation started spitting out complete nonsense. Even before the “solution’s” final line, it does not comport with proper English and isn’t at all like what the Zodiac would have written given his natural fluidity (letters, 408, et cetera). I also like how the people in this show call the Zodiac a “genius” when it suits them, but then say he’s a moron (his terrible spelling) when it also suits them. When they can’t crack the 340, he’s brilliant, but then when they try to push their “solution”, suddenly the Zodiac is functionally illiterate. Some genius. Or how they go through about three episodes before it dawns on them, thanks to someone else, that maybe the Zodiac wasn’t in the military. Or when they have the “supercomputer” spit out “solutions” to the bomb code based on the idea that permutations of input, which they hand fed to the computer, would provide a location for the bomb. When the computer spits out 250k “solutions”, they ignore the results. Garbage in, garbage out. Never mind that the solution to the bomb code may look nothing like their input, or that, given the map’s resolution, there isn’t a good way for the Zodiac to have given precise enough directions with so few characters. Then the investigators claw over Mt Diablo, just because the Zodiac’s compass is situated there. If the bomb were on Mt Diablo, why would the Zodiac have included a huge map?! Or how about the fact that the boot prints at the Bates murder are smaller than those found at Lake Berryessa? They never mention this fact at all. Or when Ed Rust claimed he knew who the Zodiac was based on the Tahoe communication and the investigators acted as if they had never seen it before. Or when they went into the woods to look for the body of Lass even though the very communication they were using for clues pictured a residential location as an alleged clue. Why would be Lass be buried in a place that has nothing to do with the apartments featured in the Tahoe letter? Why did they waste all that manpower and time tracking down some garbage “solution” to the Tahoe code even though it was clear that the solution was absolute bunk? The solution came from a man in Texas, and it was very obvious that he was just making up his solution as he saw fit. Or how just because someone was into astrology (this was 1960s California!) they could have been the Zodiac. Or how they went to the LampLighters looking for evidence that Kane was in the area at the time of the Stine murder, only to hear of a tale of someone that matched Ross’s description, albeit, very, very vaguely. They just jump from Ross to Kane to Ross to Kane, depending on whatever. Or how they just jump on the baseless idea that the gloves in Stine’s cab belonged to the Zodiac, even though that would make no sense whatsoever. Or how Craig claims the 340 starts with HEREITIS because the Zodiac supposedly read about the Black Dahlia, as if “here it is” isn’t a very common English phrase. Very specious thinking on his part. Or how none of the sentences in his solution are long, which demonstrates the ease by which one could make the Z40 say anything, even though the Zodiac often used fairly long sentences. And so on and so forth. I could do this all day long. Such a terrible, ignorant, fraudulent, disgusting show. You’re right, too much old stuff in this series. An article in Cryptologia about the new solution would have done it. I agree with Minkowski. In none of the Zodiac letters does he talk in short, broken English phrases. He doesn’t say for instance, “I to store went.” he always clearly would say, “I went to the store.” And to think or say the Zodiac is a genius is simply ludicrous…he was a murderer and he did stupid stuff all during his killing spree. Take the Lake Berryessa attack, he makes a costume to wear for one reason, to strike fear in the minds of his victims before he kills them. That costume was never made to be published in a newspaper. But, the Zodiac doesn’t kill both of his victims, the costume is leaked, and it is never mentioned or seen again. Even in the Stine murder letter the Zodiac states he was wiping the cab to leave false evidence, when we know for a fact he left a bloody fingerprint. Again, he’s made a mistake and is trying to cover them up with a false story. And we know today that serial killers who communicate their actions want us to know what they are thinking and doing because it adds to their overall intent of spreading fear. Yet the Zodiac, in his Z340 cypher, out smarts himself (if you will) and produces a product that can’t be solved. Therefore, his message of fear is lost. He in fact was so worried about it that in a later letter he asks if the police have had any luck in solving his last cypher. Today, based on what i’ve seen, I would believe that the Zodiac was actually 2 killers who knew each other and worked together (so to speak) in their crimes. I’m not saying they committed crimes together, but that they used the Zodiac name as a catchall for their crimes. Most serial killer operate under one mode; Son of Sam shot all his victims, BTK was a hands on killer…much like the Green River Killer and the Hillside Stranglers. So, it doesn’t make sense for the Zodiac to shoot into a car and kill two kids and then turn around a stab two kids at a lake. Finally, none of what i’ve seen in the show is new, so for that reason I will stop watching it. The alleged “solution” interprets the same cipher symbols to mean different letters in many different places. That’s enough right there to prove this is just hackwork. It also ignores existing cipher symbols, inserts invented plaintext symbols, and yields a plaintext that doesn’t remotely follow the usual rules of English grammar or letter distribution, all of which are indicators of invalidity. Dr. Bauer should be ashamed for allowing his name to be associated with this work. I haven’t been able to get a clear enough look at the “solution” shown recently, but it appears to have some problems. I can see 3 different symbols for the same letter in one case, and 2 for another. I get the feeling the words are forced into the code, sort of like the way my brother does crossword puzzles. It cannot be solved for one simple reason. Nobody will believe the solution and will criticize it to death. The variability factor is so high that if it is a double shift cipher, for example, the large number of characters per symbol will be seen by others as appearing cherry picked to suit the solution. For this reason alone it cannot ever be solved. Do not bother. It is impossible. Only the author of the 340 can tell us how he encrypted it and what he meant. He may have been such a rank amateur at cryptography that the real solution would surprise a great many people. Serial killers generally do not obey the rules.